An alkaline, water miscible liquid, containing a mixture of organic solvents, suitable for removing grease, oil, dirt and tarnish. For use in clock, watch and brass instrument cleaning. For the cleaning of all non ferrous metals including brass and copper. Formulated from the finest possible materials. 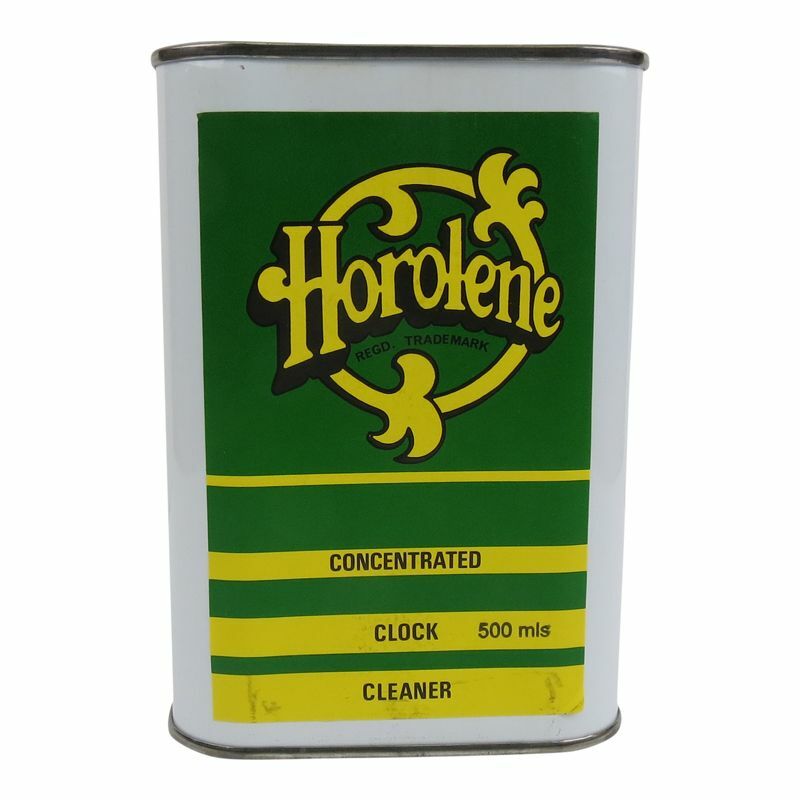 Horolene removes tarnish and verdigris from brass clock movements and all other brass and copper objects. Immerse item to be cleaned in diluted solution (7 parts water to 1 part concentrate) making it very economical to use. Dilute Horolene Concentrate in the ratio of 1 part of Horolene to 7 parts of water, and pour into a suitable container with a closed lid. Useful for this are polythene ice cream cartons or a plastic bucket for larger items. Fully immerse all items to be cleaned in the solution, and soak for the period of time necessary to remove tarnish. Each piece varies depending on how badly tarnished it is. To hasten the process you may lightly brush objects during treatment ( an old tooth brush is ideal for this). When the required finish is obtained, remove items and rinse thoroughly with hot water. Shake off excess moisture, and dry completely. The concentrate should be left in its original container, and only diluted before actual usage. Any change in colour which takes place will not affect the efficiency of the cleaner. The standard carriage charges cover England, Wales and postcode areas DD DG EH FK G KA KY ML TD AB16 AB21-25 AB30 AB39 PA19 PH3. Other areas including the Highlands, the Scottish Offshore Islands and postcode areas HS IV, rest of AB, rest of PA, rest of PH, KA27-28 will incur an extra carriage charge. Please contact us for details before ordering this product.